Yesterday, we wrote about A Shotgun, The Best Firearm for Defending Your Home. In the post, I mentioned that any firearm that is adequate for self-defense will penetrate the walls of a stick built home. By stick built, I am referring to two X fours studs and sheet rock. This covers the majority of the newer homes at least in the area in which I live. So today, I will write on the dangers of ammo penetration. Anytime you use a firearm for self-defense you have to be aware of what is behind your target. Many of your more powerful rifle and even handgun rounds have the capability to exit though a body and still cause additional damage. This is the reason that I like a shotgun for use in a house. With the correct rounds it has the ability to stop someone and while it will penetrate a wall, its penetration is limited. Depending on your size and gender, you may want to consider using a low recoil round like the Federal Power-Shok Low Recoil Buckshot. Understanding the dangers of ammo penetration in walls and to other materials can be valuable to you in two ways. One it can make you aware of the damage that your firearm can cause and two it can make you aware of the level of protection you have, if someone is shooting back. I picked a 30-06 to use as an example of a rifle round that can cause over penetration in your home. The reason that I choose this round is one it is still pretty common, two it is not to hard to compare it to other rifle rounds and three I have good reliable information on this round. 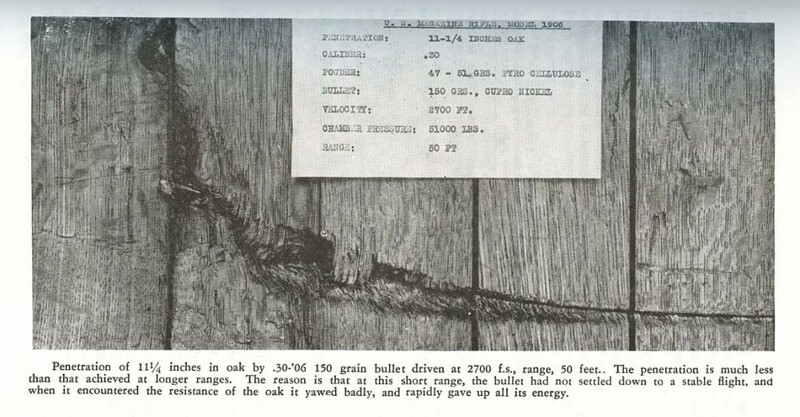 Below you will see the results of test conducted by General Hatcher on the standard old military 30-06 round. As you can see, the round has more penetration at 200 yards than at a shorter distance because it has stabilized. This is a subject that hundreds of pages could be written on and many people will disagree with me. I will state right now that this is just a guide for people who are not into firearms. If you are thinking about getting a home defense weapon, start out with a 12-gauge pump shotgun. Hopefully you will never have to use it in self-defense, if you are forced to use your firearm in self-defense within the confines of your own home you need to make good clean hits on your assailant and be damned sure of what’s on the other side of the wall they’re standing in front of. To do this you need to practice. Get some good training. Canes,Walking Sticks and Umbrellas for Self Defense. This entry was posted in self defense and tagged ammo penetration. Bookmark the permalink. A small ammunition can filled with sand. A cinder block filled with sand (block will probably shatter). A plate glass windowpane at a 45-degree angle (glass fragments may be thrown behind the glass). A car body (5.56-mm rounds penetrate but may not always exit). Barriers that offer protection against 5.56-mm rounds are also effective against 7.62-mm rounds with some exceptions. The 7.62-mm round can penetrate a windowpane at a 45-degree obliquity, a hollow cinder block, or both sides of a car body. It can also easily penetrate wooden frame buildings. Continued and concentrated fire can breach most typical urban walls. Such fire cannot breach thick reinforced concrete structures or dense natural stone walls. Internal walls, partitions, plaster, floors, ceilings, common office furniture, home appliances, and bedding can be easily penetrated by 7.62-mm rounds. This manual is fairly old (pre-war on terror), and as such I cannot confirm which 5.56mm rounds it is relating to. All rounds of any calibre are not created equal- a 55gr lead point 5.56mm and an M855 62gr with a steel penetrator are almost as different as 12 Ga #1 buck and 12Ga 00 buck.